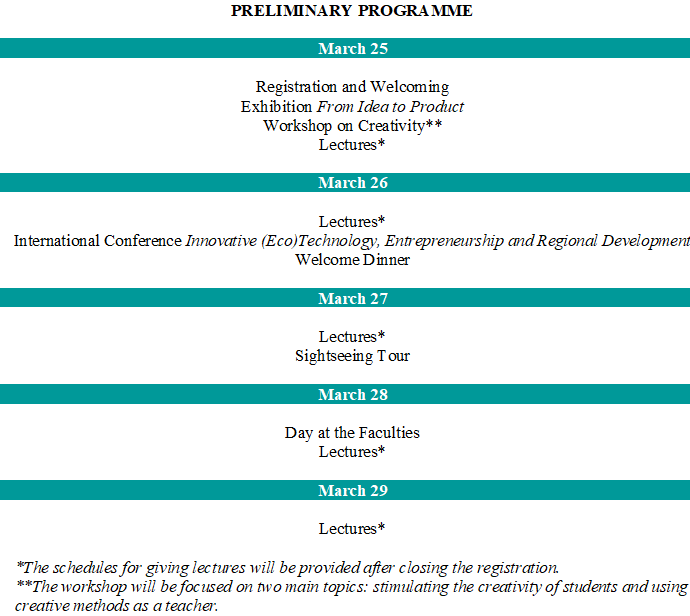 It is a great pleasure to invite the academic staff of our partner institutions to the 11th International Week at KAUNO KOLEGIJA / University of Applied Sciences “From Idea to Product” which will be held on the 25th–29th of March, 2019. We would like to draw your attention to practical use of the studies, applicability of the final product, and the need of creativity. You are very welcome to share your experience in creating something from scratch, in using the creative methods for working with students, or any other practical activities that meet the needs of the learners and the society. Also, the teachers are invited to give lectures for students in eleven study areas. We expect you to arrive on Sunday (24th of March, 2019) as the activities will begin from Monday morning (25th of March, 2019). The deadline for the registration is on the 1st of February, 2019. Feel free to choose any hotel in Kaunas.